Jian Ghomeshi of CBC's cultural affairs show "Q" conducted an interview with Slash during his recent visit to Toronto, Ontario, Canada. The 21-minute chat can be viewed below. Slash will release his second solo album, "Apocalyptic Love", on May 22 via his own label Dik Hayd International distributed through EMI. On Saturday, May 19, the group will appear on DIRECTV's The Audience Network for the season premiere of "Guitar Center Sessions" airing at 8:00 p.m. ET. For the first time ever, Slash and the band will perform an acoustic set spanning new songs and classics. Slash and Myles Kennedyalso sit down for an intimate behind the scenes interview with renowned music journalist and "Guitar Center Sessions" host Nic Harcourt. 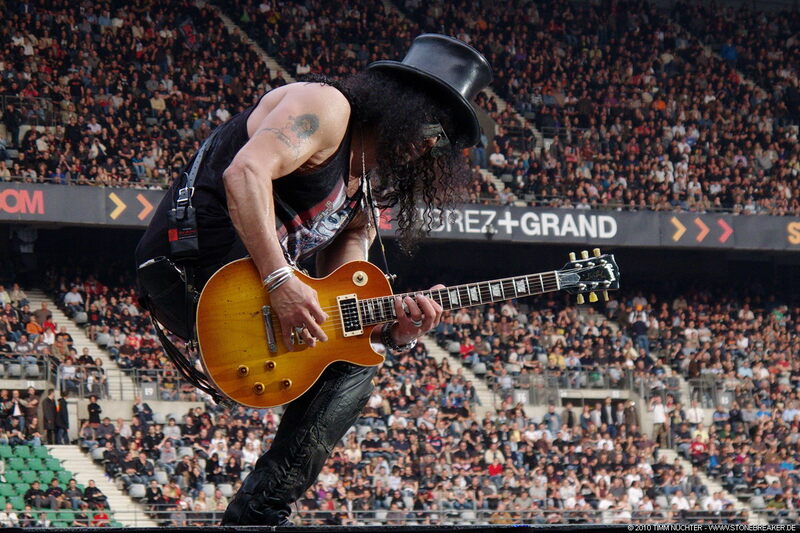 In touring news, Slash and the band will kick off a headlining U.S. tour May 3 in Baltimore. The trek will encompass three festival appearances: Saturday, May 5 at Carolina Rebellion; Saturday, May 19 at Rock On The Range; and Friday, May 25 at Rocklahoma. Also on tap is a special CD release show set for Tuesday, May 22 - the day the album streets - in New York City at Irving Plaza.